Lot 5A ( 5.35 Acres), Lot 6A (5.40 Acres), Lot 6B (3.93 Acres) Callahan Addition of Warm Springs subdivision. The three properties may purchased together for $400,000. Total acreage is 14.68 Acres. Owner financing is available with terms. Lot 6B is the only property which can be purchased separately for $99,950. 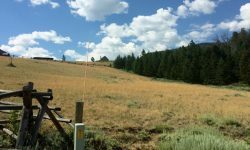 Beautiful, level lots on a small bench overlooking the valley with expansive views of Ramshorn Peak, the Absaroka Mountains and Shoshone National Forest. Less than four miles from town yet private and spacious area. 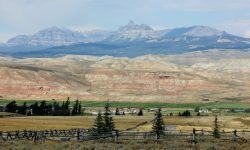 To the south of this small subdivision are a large private ranch, Shoshone National Forest and Bureau of Land Management (BLM) public lands. Remarkable views and no covenants on this 10.38 Acre +/- parcel on Bald Mountain Road. Its close proximity to the Dubois Municipal Airport makes it an ideal prospect for the flying enthusiast. 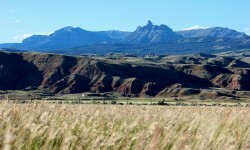 It is located on a level bench overlooking the Wind River Valley, only four miles west of Dubois. The property is bordered on all sides by private parcels, including a large private ranch on the south and west. 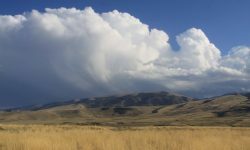 8.53 total acres with breathtaking mountain views including the red rock badlands, Absaroka Mountains, Ramshorn Peak, and Shoshone National Forest. Moderate slope covered in mature Douglas fir, Lodgepole Pine, and Spruce trees, native grasses, and scattered sagebrush. Phone and internet access are to the property line. Electric power is to the property across the street. Community Well. 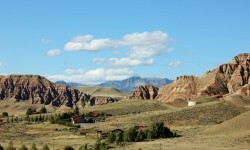 Very close proximity to Bureau of Land Management (BLM) and Shoshone National Forest public lands. Partially fenced on the South, West and East. 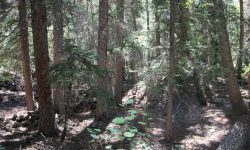 3.98 +/- Acre mountain property with seasonally-flowing Warm Spring Creek running through. Level site at road with a moderately steep hillside beyond. Heavily timbered with mature Spruce trees and Aspen. Within minutes of public lands access and the convenience of town. This horse-friendly 1.93 Acre property is sheltered by the picturesque red rocks of the Badlands, with stunning views of Whiskey Mountain and the Wind River mountains. It is in Painted Hills subdivision, one mile east of Dubois. Electric box is on the property. Town water is available for the applicable tap fees. Telephone and Internet services are available. It has year round access and close proximity to town; yet it is very private. Painted Hills is adjacent to State and BLM public lands which offer miles of recreational opportunities, including hiking, horseback riding, cycling, geology, bird watching. Property owners in this subdivision can also enjoy a private common area on the free-flowing Wind River. Protective Covenants apply.